We stock a wide range of aromatherapy products from essential oils, carrier oils and base oils to roll-on sticks and diffusers, which would make a great gift for a loved one. Our ultrasonic oil diffusers are among our most popular products at the moment. There’s no heat involved – you just add tap water and an essential oil of your choice. They are immensely popular with our customers and would make a great Christmas gift. Natural and organic beauty products make wonderful gifts too, and there are plenty of brands and products to choose from, ranging from bath oils and body balms to moisturisers and haircare ranges. There are options for men too! A selection of products arranged in a gift box or basket would make a very attractive gift. We produce our own range of natural beauty products too and we have boxed gift sets of some of our best products. We have found that a lot of our customers have become interested in crafts and making things in recent years, and we now stock some great kits for making your own natural soaps as well as candles from soya or bees wax. We also have a wonderful kit for making your own natural shampoos, conditioners and body, hand or face creams. This could be a great present idea for someone who is creative. Foodie types might like a selection of healthy cooking oils or condiments, or perhaps one of our glass teapots and a selection of herbal teas. We also stock a wide range of cookery books and books on various aspects of healthy living from authors like Dale Pinnock and James Wong, which could make a nice gift. I think generally people are now much more aware of organic, fair trade and free from offerings compared to, say 10 years ago, and this growing popularity is extending to traditional Christmas foods. In terms of festive food we stock a range of healthy, organic, free from and fair trade products which are always popular with our customers. Our gluten-free Christmas stock this year includes mince pies, Christmas pudding, nut roasts and chocolate truffles alongside our usual range of gluten-free biscuits, crackers, flours and pastas. We also stock a range of healthy snacks such as nuts, seeds and dried fruit, which will go well with Christmas drinks. And of course we have our mulled wine spice kits which are wonderfully warming. For those who are baking Christmas breads and cakes we stock a range of healthy flours, cooking oils and natural sugar alternatives. From seasonal food and drink to gift ideas, your local health store has got it all covered! 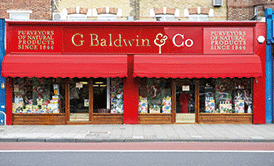 G. Baldwin & Co is based at 171/173 Walworth Road, London, SE17 1RW. The store was first opened in 1844 by George Baldwin in its original location of 77 Walworth Road. It was passed on to the Dagnell family in 1919 and is now London’s oldest and much loved herbalist. Over the course of its history the store has been run by Steve Dagnell’s father and grandfather, and is now managed by Steve himself. Originally specialising in herbal remedies, the store has grown to the point where it now stocks a wide range of health foods, vitamins and supplements, natural and organic bodycare and household products as well as gift sets and books. Now located on 173 Walworth Road, the store still has the air of an apothecary, with wooden floors, old-fashioned counters and shelves stacked with herbs, oils and ointments. You can contact the store by calling 020 7703 5550 or visiting www.baldwins.co.uk. Follow them on Twitter: @baldwinsuk or Facebook: /BaldwinsUK.